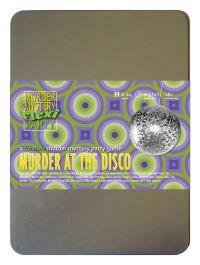 You've been invited to play the role of GENOA JACKSON in Murder at the Disco. New York, 1977. Hot nightclub Disco 54 is hosting a birthday and only the coolest people are there. But before anyone can 'get down on it', nightclub owner Doctor Disco is found dead in the VIP lounge! Join us to find out whodunit! Always ready to hit the singing stage, you wear heels and a black sequinned dress to catch the spotlights - and the eye of music producers. Red lips, neatly coiffed dark curls and, of course, your microphone complete the look. My name is Genoa Jackson - yeah, that’s right, I’m a Jackson. I’m a backing singer and I’ve sung with all the greats: Michael, Diana, Gloria, Donna, those are just some of the artists I’ve got on 8-track. I came to Disco 54 today to audition for Doctor Disco. It was supposed to be my big break. Now we’re all here, while that man’s dead body is still lying in the VIP lounge. Man, that’s bad ju-ju!